Drag Racing, Roll Racing, Drifting, Car Show, Bikini Contest, and much more! 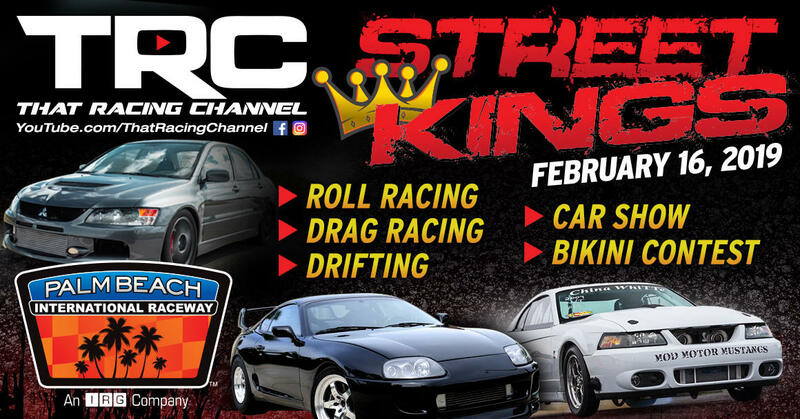 Welcome to TRCs 2nd Annual Street Kings Event! Following classes have 100% payout with buy in money 80/20 split for winner and runner up. Ladder: If we have 17 or more cars in a round the cars will be randomly paired in the staging lanes with a deck of cards, and the bye run will be chosen with the deck of cards. Once we get down to 16 cars or less in competition the class will be paired on a ladder based off their ET. Body: Any year vehicle is allowed. Chassis: Any type chassis is permitted. Must have doors, no dragsters or promods. Suspension: Any type suspension is permitted. Windows: OEM glass or lexan permitted. Electronics: Delay boxes, electronic throttle stops, and stutter boxes are prohibited. Shifter: Any type shifter is permitted, except as noted. Air shifters and electronic shifters are prohibited. Tires: Any size/type of tire is permitted. Body: Any year vehicle is allowed. Lightweight components are limited to hood, front fenders, deck lid, hatches, sunroofs, wings, ground effects, bumpers, doors, and roof only. Aftermarket doors must be factory. Quarter panels must remain steel. One-piece front ends are prohibited. No body parts may be removed during competition. Chassis: All cars must retain complete stock chassis, floorboard, firewall, and frame rails. Suspension: All cars must utilize stock front and rear suspension and mounts. Aftermarket front control arms, rear control arms, and sub-frame connectors are permitted. Aftermarket struts and shocks are permitted. Lights: Headlights and brake lights are required and must function. Windows: The front windshield, rear window, and all side windows must be OEM glass. Side windows are not required to go up and down. Interior: Stock dashboard and full interior from front seats forward is required (passenger seat may be removed). Transmission: Manual or Auto transmissions are permitted. Any style automatic transmission is permitted.Manual transmissions are permitted to use aftermarket stock-style clutch-assisted transmissions. Oiling System: Any type oiling system is permitted. Engine: OEM blocks are permitted. As the names would suggest, this is for the most extreme street cars. This is an anything goes class. If odd number of cars, Joker or high face card gets bye. Car must make a clean pass to advance. Chassis: Full tube chassis prohibited. Front half or back half cars allowed. Tires: Must be DOT approved, Drag Radial, or Bias Ply no larger than 28"x10" or 325 Radial. The group cruise may be "skipped" if all racers & TRC/PBIR Staff are satisfied that all shootout participants are actual "street cars." This will be up to the PBIR staff discretion. No major vehicle changes are to be made after the cruise except for changing tire pressure or heating a nitrous bottle. Body: Any year vehicle is allowed. Lightweight components are limited to hood, front fenders, deck lid, hatches, sunroofs, wings, ground effects, and bumpers only. Roof, quarter panels, and doors must remain steel. One-piece front ends are not permitted. No body parts may be removed during competition. Chassis: All cars must retain complete stock chassis, floorboard, firewall, and frame r ails. Notching of chassis for clearance is permitted. Aftermarket "K" members are permitted. Suspension: "Stock Style Suspension" All cars must utilize stock front and rear suspension and mounts. Aftermarket front control arms, rear control arms, and sub-frame connectors are permitted. Aftermarket struts and shocks are permitted. Ladder bars, four links, and wheelie bars are prohibited on all cars. Windows: Car must retain factory door glass. Lightweight front & rear windshields permitted. Interior: Stock dashboard and full interior from front seats forward is required (passenger seat may be removed). Aftermarket seats, gauges, and interior are permitted. Exhaust: Muffler(s) are required unless vehicle is turbocharged. Exhaust may exit anywhere. Electronics: Two-steps, data loggers, aftermarket ECU's, and engine management systems are allowed. Driveline: Aftermarket axles, ring and pinions, final drive, spools, and differentials are permitted. IRS cars may convert to straight axle. Transmission: Manual or Auto transmissions are permitted. Any style automatic transmission is permitted. Trans-brakes are permitted. Clutch: Clutch must be manually operated by driver's foot. Shifter: Strain gauges are permitted. Air shifters and electric shifters are prohibited. Fuel: Any type of fuel is allowed but you may not add extra fuel until after the cruise and round 1 of eliminations is over. At that point you may add fuel. Tire Rule Exception: Any FWD or RWD cars that have a MANUAL transmission may run a SLICK no larger than 28"x11.5. Engine: No restrictions! But must have a functional alternator and radiator. Nitrous: No restrictions! Nitrous cars will be allowed to heat their bottles before the round and swap out/fill up bottles between rounds. Slicks or Drag Radials only. Street Tires are prohibited. Only open to 5 speed, 6 speed, and 7 speed H-pattern manual vehicles. No exceptions. No sequential alterations are permitted. No strain gauge allowed. Factory frame rails required. No full tube chassis. ANYTHING GOES, RUN WHAT YA BRUNG!